Part of my training at makeup school was colour testing, and I remember at the time thinking “ this is so worthless to learn”, but actually it is probably one of the things I have gotten most use out of, and where I feel I have been most helpful to others. Now I am not talking go colour testing nuts and never where colours that aren’t a 100% in your colour circle ever again, or walk around with paint sample things in your bag with your colours, only buying colours that match (I have seen my fair share when colour testing was a big thing). And even though it doesn’t seem that important knowing your colours before your mid thirties, as younger skin can get away with a lot more, getting your colours right can really take 10 years of you, or add 10 if you get it wrong, so worth knowing at any age. I will try and make this as simple as possible, as the main thing to know is if you look good with warm colours or cooler colours. So if you look at the colour wheel above you can sort of split it half and see how one side has more blue and the other more yellow in the colours (with one warm having sneaked into the cool side), and when you have found your colours, this is how you should look at things, if they have a cold (blue) undertone or a warm (yellow) undertone. But even warm colours can sometimes have a cold undertone and wise versa. 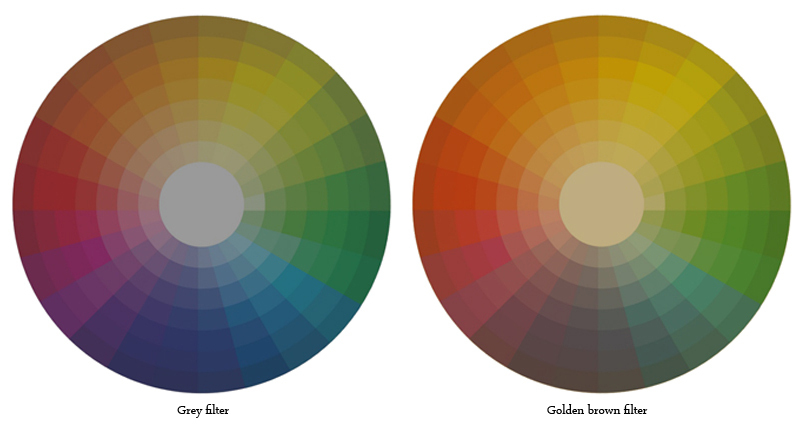 If you see the picture below, one colour wheel has a grey filter over it (more cool coloured) and the other a golden brown filter (more warm), to illustrate a cold and warm version of the colour wheel. Hope I haven’t lost you yet! I know this subject can be a bit hard to figure out. So how do you find out what colours suite you? The easiest way is to look at your eye colour, your natural hair colour and your skin tone, even though I find that people often gets confused when it comes to skin colour, so let’s skip that one as looking at eye and hair colour is often enough I find. Take a look at your eye colour, do they have a cold or warm undertone to them? For instance if they are clear blue, you might be best with cooler colours, or if they are more golden green, warm colours might be for you. Same with hair, does your natural hair have a red undertone to it or more of a “greyish” (not grey as in grey hairs, but more of an ash tone to it). Best test is really to bring out all your clothes and/or makeup and just try things out, with a clean no makeup face. So with clothes, hold the colour up under to chin, and if a colour makes you look washed out or just makes your bare face look dull, then the colour might not be for you and you put it in a bad pile. But if it brightens your completion, makes you look fresh and compliments your skin tone, then you can put in the good pile, and slowly you will probably see a pattern forming. Same with makeup really, and you have probably tried a lipstick on and it made you feel like you where wearing way too much makeup, that was probably because it was the wrong colour for you. The right makeup colours for you should sort of look like they belong on your face naturally, even bright colours, so if you look to “made” up, then the colour might not be for you. A test of making one half of the face up in warm colours and the other in cold, can also be a great test, as you can really see the difference. Once you realise what colours suite you best, it really does make things like shopping or deciding things so much easier, even like choosing a new hair colour that suites you becomes so much easier. A good example I have, is when I was out shopping with a friend, we went into a beauty shop to look at makeup, and she went straight for some red lipsticks. She had seen this picture in a magazine of a women wearing a very bright orangey red lipstick, and thought it looked so nice that she wanted to try wearing red lipstick for the first time, but had now tried countless of lipsticks but hadn’t found one she liked. The problem was that she has clear blue eyes and naturally ash blond hair, so an orangey red would always look not quite right on her. I explain to her why she might wanted to go for a more cherry red instead, as it has a more blue undertone and would suite her better. We found a great cherry red lipstick for her, and she now can’t get enough of wearing red lipstick. 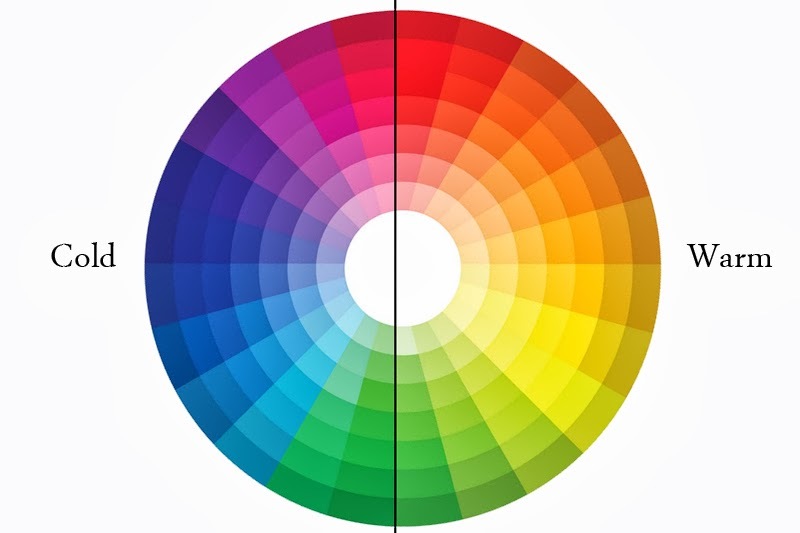 So if you see the picture below, it sort of illustrate how reds, like most colours can be cold and warm, and when you see them meeting in the middle where they are the lightest, you can clearly see that one has a pink undertone and the other a peach undertone. So there is a red for everyone, you just have to find the right red tone for you. But don’t stress too much about it, it is after all clothes and makeup we are talking about, and those things are suppose to be fun, not stress you out. So have fun with it, as finding your colours can be an interesting and fun experience if you let it. If you want me to go more into details about colour testing or maybe show more colour scales of colours in cool and warm, please let me know in the comments below, and I will see what I can do. Why M&S has become one of my favourite shops.